The essays in this collection examine the public construction of languages, the linguistic construction of publics, and the relationship between these two processes. Cultural categories such as named languages, linguistic standards and genres are the products of expert knowledge as well as of linguistic ideologies more widely shared among speakers. 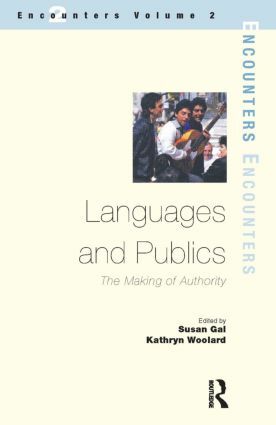 Translation, grammars and dictionaries, the policing of correctness, folklore collections and linguistic academies are all part of the work that produces not only languages but also social groups and spheres of action such as "the public". Such representational processes are the topic of inquiry in this voume. They are explored as crucial aspects of power, figuring among the means for establishing inequality, imposing social hierarchy, and mobilizing political action. Contributions to this volume investigate two related questions: first, how different images of linguistic phenomena gain social credibility and political influence; and, secondly, the role of linguistic ideology and practices in the making of political authority. Using both historical and ethnographic approaches, they examine empirical cases ranging from small-scale societies to multi-ethnic empire, from nineteenth-century linguistic theories to contemporary mass media, and from Europe to Oceania to the Americas. Contributors include Susan Gal, Kathryn Woolard, Judith Irvine, Richard Bauman, Michael Silverstein, Jane Hill, Joseph Errington, Bambi Schieffelin, Jacqueline Urla and Ben Lee.